The dogs are scratching at the back door and poised, once again, to pursue the possum family who lives under our shed. It’s a good deal for the dogs, all the challenge of a wildlife encounter and yet the game is rigged and they always win. Otis, sweetly dim, doesn’t understand his role in the ever-looping possum death-and-resurrection act. Opal, the brains of the pair, has it figured out and is still an eager participant in the nightly ritual. I’m prepared for the predictability of their canine missions because I wake up at 3:20am more nights than not. It’s the exact time of my last night feeding when I nursed our twins. It doesn’t matter that it was twelve years ago, my body still remembers. The dogs’ storming of the backyard cues our dieting orange cat to lumberingly leap up on to our bed. She begins kneading my belly while practicing for the world’s loudest purring contest. She wants food and her face rubbed. My husband, Matthew, decides to come to bed. He can sleep anywhere at anytime, on command. This sleep superpower allows him to keep odd hours and often he works late into the night. It’s like a parade coming through our bedroom. His toothbrushing process is unexplainably noisy and bright. The dogs burst into our room and immediately remember the menacing possums. Thirty seconds later, utilizing his sleep superpower, Matthew is in a deep slumber and I’m awake, waiting to let the dogs back in the house. Eventually, the dogs scratch to come in and curl up on their bed next to us. They also have Matthew’s sleep superpower. I’m a fragile sleeper. Ideally I need blackhole-like darkness and silence, as well as a constant room temperature of sixty-eight degrees. I found my perfect sleep environment only once. It was on a cruise ship, of all places. Surprisingly, my tiny room at the bottom of the ship hit every one of my sleep metrics and added another to the list. A gentle hammock-like rocking is now another must have for my sleep utopia. I remember that my daughter’s jeans are still wet in the washer and decide that I better get up and start the dryer so she doesn’t suffer another mother-induced fashion nightmare. Yes, she is in middle school. I make coffee and feed our ravenous dieting cat. There are a few dishes to finish from last night and I catch up on emails. It’s quiet, dark and cold so I should be sleeping but I’ve had too much coffee. I continue to putter and start on my to-do list. This is the calmest, most productive part of my day and the only moment when I’m not surrounded by animals and people. I’m instinctively fidgety because my body knows what’s coming. It’s time to rouse the three teenagers sleeping upstairs which begins our daily version of the Jerry Springer show. Each of my children wakes tired, argumentative, and usually mad at me for a reason yet to be discovered. One of our daughters is ridiculously organized and driven crazy by her twin sister whose optimal morning functioning hovers at feral. The feral child’s morning routine has me yelling, marine-sergeant-style, at every turn in the process. Our fifteen-year-old son gets up eight minutes before we pile into the car. He and I argue every morning about him cutting it too close. More often than not he’s the first kid ready. He sits on the couch, the victor, waiting and gloating. The rest is a blur of breakfast choice complaining, signing papers I don’t read, a million items lost and mostly found, and bad lunch-making reviews. It all comes to a crescendo with me hollering out the countdown to the minivan’s departure. Matthew is up now and has words of sunshine and happiness for the kids as they finish loading their backpacks. Somehow he is always the good guy. He’s miraculously rested after his micro-nap. In contrast, my head is spinning as the kids exchange last minute barbs and we push through the front door. The minivan pulls away from the curb while the automatic side door is still closing. Our organized daughter continues her lecture on my soft, ineffective parenting style. After a few merciful miles into the drive, the girls find their way to a truce and recap yesterday’s lunchroom conversation. Eli, sitting in the passenger seat, informs me that now that he’s taken Driver’s Ed he realizes that I’m a terrible driver and that if he was a cop he would follow me around all day and give me tickets. I drop off the kids and breathe deeply in the splendor of my empty minivan. I spend the drive back home thinking about ways to tweak our morning routine to go more smoothly. All my analysis and best plans don’t have a chance. Animals, teenagers and parents of teenagers are not rational beings and time management theories do not apply to this stage of life. My twenty-one-year-old son serves as the light at the end of the tunnel. As a teenager, he was just as surly and pushed back with as much gusto. Today he is a well-adjusted, functioning young adult who actually likes my husband and me. Resigned to five more years of morning anarchy, I remind myself that kinder, awake teenagers will return home this afternoon. 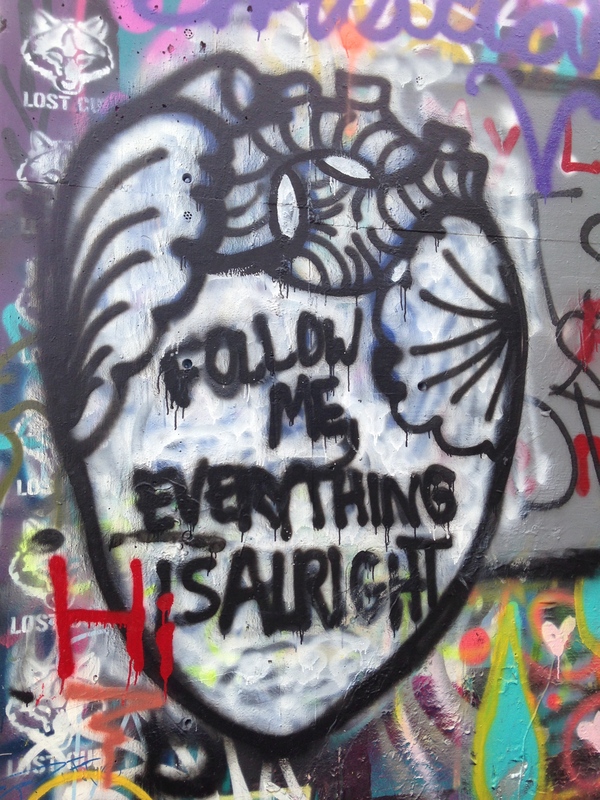 I took the photo at Graffiti Park, Austin, TX.